I was busy cooking for the Whiz Kids tutoring program dinner yesterday and was rooting around in my kitchen for something to nibble on when I made an incredibly delicious accidental dish. It all starts with celeriac (sometimes called celery root), the weird thing you see at the left that looks a bit like an octopus. 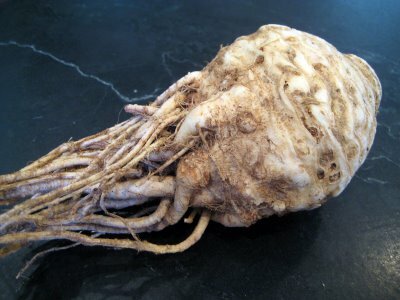 It’s a root vegetable and I’ve been getting them from my farm during the winter harvest. You cut off the roots and peel it and you’ll find it has a mild celery taste. 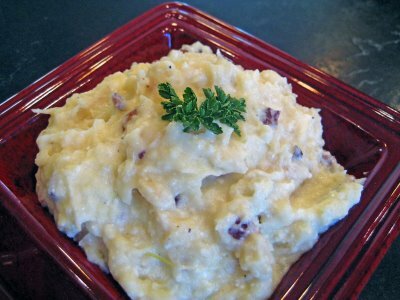 It’s often used in combination with potatoes to make a mashed vegetable dish, and I had some of that left over in my refrigerator. I also saw a hunk of goat cheese in there so I added that to it, heated it up, stirred it all together and voila – heaven in a bowl! Add potatoes and celeriac to a large pot and cover with cold water. Bring to a boil, add salt, reduce to simmer, and cook until soft. While the potatoes are cooking, fry bacon in a large skillet until very crisp. Drain fat completely on paper towels. When the vegetables are soft, drain and return to the hot pot. Add the butter, heavy cream and goat cheese crumbles and mash together until smooth. If you prefer a creamier texture, add more cream, chicken broth, milk or a little of the potato cooking water. Add bacon crumbles and season with salt and pepper to taste.